1. SMP or scalp micropigmentation is basically a tattooing process of the scalp in which tiny dots of permanent ink are placed in between hairs or on empty areas of scalp to replicate the look of hairs. 2. A special injector is used which is similar to the injectors used in tattooing to place the ink in the dermal layer of skin, but the injector tip is broader in SMP than the normal tattoo as it has to be the size of human hair. 3. The small dots are the size of a human hair and hide the appearance of the bare scalp, making it look as if there is a dot of human hair. This makes it appear as if there is hair in the region. 4. SMP is thus a method of camouflaging and not actual growth of hair, but it works as if new hair has grown in the area. By covering the bare areas of scalp, hair density appears to increase and the area of baldness or thinning hair gets hidden. 5. The dots of SMP last from 5 to 10 years. There are differences in the lasting depending on individual differences. Once they have faded, SMP will be needed again. 6. 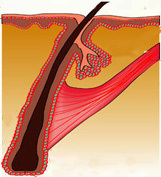 SMP is most useful in cases of thinning hair, i.e., where there is hair but the scalp shows through the hair. Hence it is most useful in cases of early diffuse baldness in men and in female baldness. SMP combined with hair transplant can completely transform female pattern baldness. 7. SMP can also be used in eyebrows to thicken the look of the eyebrows, and in scars in beards and moustaches. It is also very useful after hair transplant to cover the donor area when it is thinned out making it look natural again. 8. SMP is sometimes used in the completely bald head also, where it gives the appearance of a closely shaven head of hair, but achieving a natural look can be difficult in a completely bald person. It is best to do hair transplant first in such cases and then do SMP in between. 9. Arogyam Hair Clinic uses natural inks which are imported from the US and are very long lasting without any colour change. 10. Cost of SMP varies according to the area covered. Covering the whole head would cost around Rs 6000, while it may be slightly lesser in females. Come for consultation to know the exact cost. Contact at 7637089211 / 9854041111 to know more about this procedure.